On occasion an alum of Mount Michael or a fellow monk, (a confrere) will give me a book to read and then want me to share my thoughts about the book with them. 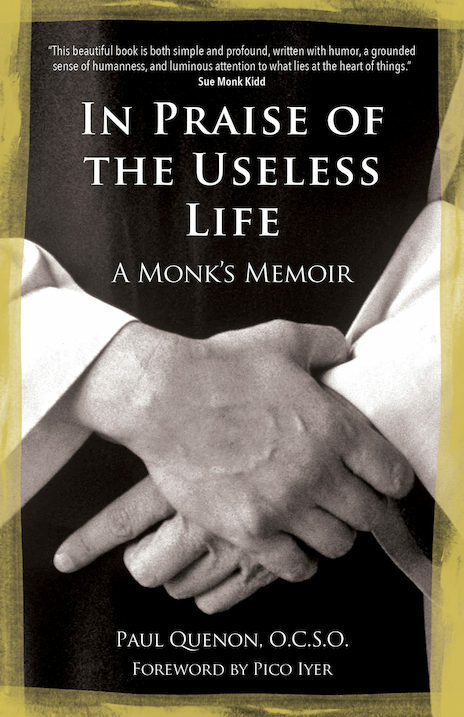 So most recently a book which I found in my abbey mailbox was: IN PRAISE OF THE USELESS LIFE by Paul Quenon. He is a monk at Gethsemani Abbey in Kentucky where Thomas Merton was a monk — Cistercians of Strict Observance. Before I express my views of the book, I want to mention that I have always had an interested in this type of monastic living. I remember when I was still in elementary school when I would receive brochures from Trappist places, how I enjoyed seeing photos of these places and reading about this lifestyle. There was a time when I actually spent a week at Christ in the Desert in Abiquiu, New Mexico. I had a high school classmate who was a monk there at the time. I must admit that it was a good experience and I still feel I could live that type of life. Now back to IN PRAISE OF THE USELESS LIFE— Admittedly I received the book during Christmas vacation and it is always nice to get cozy in my room and read during this time. Honestly, I could not put the book down. It really spoke to me in many ways. I have read a lot of Thomas Merton’s books and have enjoyed his life story even before he became a Cistercian monk. His love of literature and writing always attracted me to him. So to hear indirectly about Merton again through the eyes of one of his novices was a whole new experience to me. I felt I was actually there at Merton’s funeral and the cemetery when Paul Quenon writes about Merton’s death and burial. Other fantastic aspects of the book would be Paul’s love of nature, music and singing, dance and dancing, flowers and birds, poetry and writing and the hermits and hermitages and of course his tender treatment of his confreres. Paul is also a photographer and it is obvious that he can say a whole lot with only using photos or a few words. Many of his photos appear in MONK’S ROAD— Gethesmani Into the Twenty-First Century — a collection of photos and history of Gethsemani in Kentucky. By reading Paul’s book and paging through MONK’S ROAD, I felt like I was actually at the abbey. It was a great experience and a great book. If you would like to have a gentle, peaceful God experience, I strongly encourage you to pick up this book and give it a chance. May our loving and caring God embrace you with some Cistercian Spirituality.